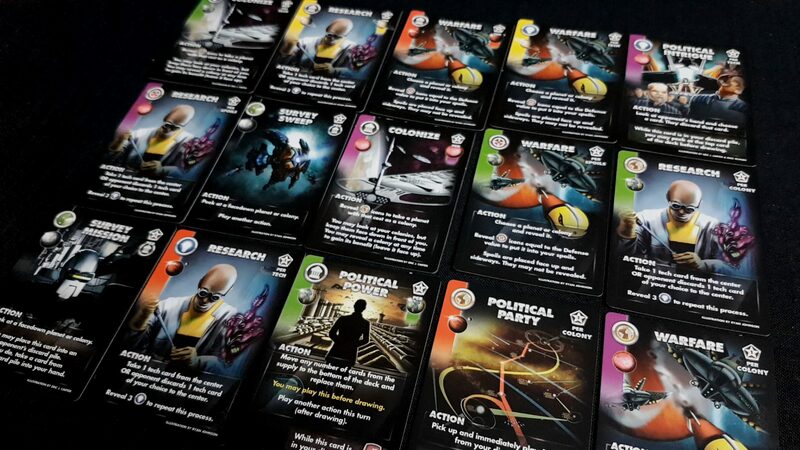 If it were a game with different theme I think Eminent Domain: Microcosm would probably be worth somewhat more than the miserly two and a half stars we gave it. That rathough though feels a good deal more appropriate when you consider how few stars it itself puts in the cosmos it proclaims to give us. Space exploration is too grand an endeavour to fit in a microgame. The infinity of the black should be respected, and Microcosm doesn’t do that. It’s a shame really – there are ideas in there that I would have loved to have seen developed and explored with something more appropriate for the clever intermeshing of mechanisms it gives us. Sadly, we can’t always get what we want as Chuck Berry once memorably said. If we could I’d be a starship dogfighter bringing hot laser vengeance to Kilrathi marauders on the Terran frontier. I’m not though. I’m just a guy, writing an accessibility teardown, of a game I didn’t enjoy all that much. Let’s just… let’s just get on with it. Colour blindness is well supported, although Microcosm is still making use of a problematic colour palette. Every action in the game has written text and iconography to go with it, and usually clearly differentiable artwork. Colour is never the sole channel of information here although certain categories of colour blindness will make some icons a little difficult to make out at a distance. The planet cards share this issue – they are possible to differentiate because they have different imagery to tell them apart but again it’s not always as easy as it could be. The larger art is hard to mix up, but the much smaller planet iconography along the left-hand side of the card is more of an issue. None of this is likely to make the game unplayable and there are few enough cards that it’s possible to simply rely on familiarity. We’ll recommend Microcosm in this category. 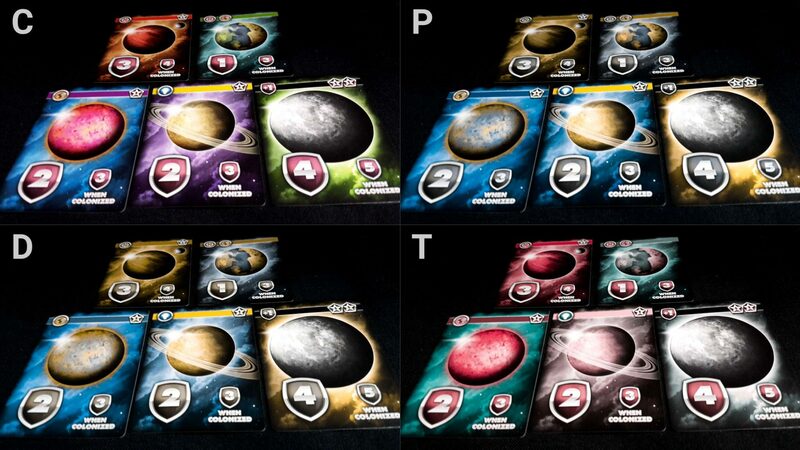 There’s an awful lot of information presented on each card, including special icons (used to ‘boost’ actions you take), scoring contexts, and planetary affiliation. 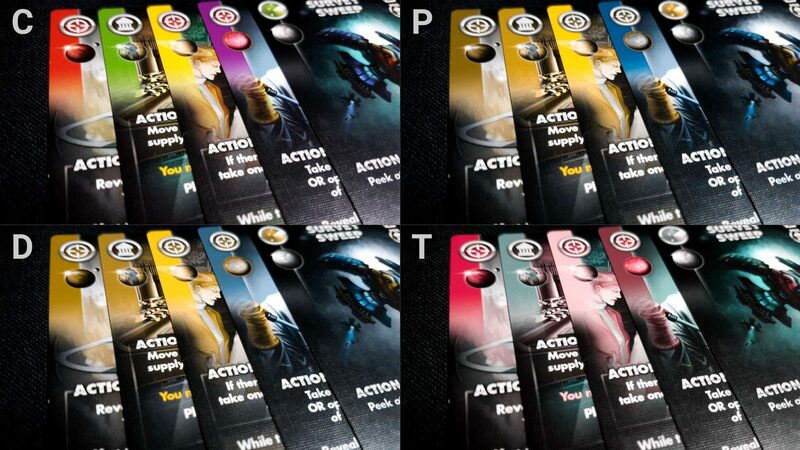 Each of the action cards too will come with a substantive chunk of text to describe its (sometimes situational) effect. Contrast is occasionally problematic too – for example, with yellow planets and brown icons against yellow stripes. Text is letterboxed but with a transparency that allows the background art to bleed through and this occasionally has an impact on what is otherwise very high contrast text. The planet cards and research cards on the other hand are generally fine for visual accessibility – large, with key information presented in an agreeably generous font. They’re less busy too, which is another boon. However, while that’s true of revealed planets those that have yet to be surveyed have their ‘difficulty’ in a small font on the back that makes it somewhat difficult to make out at a distance – especially when its poor contrast is taken into account. Occasionally actions will permit a player to ‘peek’ at a card and this might be a problem – sometimes sighted assistance will be necessary to resolve ambiguities although if sight with an assistive aid is possible the game is likely to be broadly playable. For those with total blindness, the situation is predictably considerably bleaker but that doesn’t necessarily mean the game is entirely unplayable. Since everyone knows who took which cards, there isn’t much to stop it being played entirely open state. Some changes would be necessarily – particularly with regards to ‘peeking’ at cards and maintaining colony privacy. I’d certainly expect a workable variation could be work-shopped, but a considerable amount of the limited game play focuses around an informational asymmetry that would be lost in the process. If players want to play the game as it is presented, the secret information in the game is the primary barrier to play. We’ll tentatively recommend Eminent Domain: Microcosm in this category. The game rules are simple, but they’re not helped by what is perhaps the least useful manual I’ve ever read. There’s so much in there that is not described and basically left up to the players. Most of the basic mechanisms of the game aren’t even explained, with the cards being forced to do the heavy lifting. As such, literacy requirements are reasonably high and despite there being only eighteen action cards there are a lot of subtle effects that need to be employed in the right kind of ways. For example, ‘look at an opponent’s hand and choose a card. They discard that card’. That’s a powerful thing to do at the right time and merely mildly aggravating otherwise. Some cards have special effects when they are in the discard pile, and it’s a cognitive cost on people to remember what they are. The peeking mechanism which is used liberally throughout is likewise something that introduces an asymmetrical memory burden in play. You’ll also want to pay close attention to the action cards someone collects because that tells you a lot about how they’re going to be able to score and that in turn will give you a lens on their future behaviour. There’s no way of tracking this, although there’s no real harm here that comes from playing that part of the game with open state and that’s how we’d recommend you play. Numeracy required is also high, not just for scoring but also when it comes to selecting cards. Each one has a scoring context that influences their value and choosing the right cards is key to winning. It’s possible to dominate another player and yet lose just because they had a better set of cards with which to score. As such, planning is multi-level – both in terms of getting cards that emphasise accomplishments but also in terms of getting cards that permit accomplishments. Sometimes the right card isn’t the one you immediately want. In any case, taking a card is going to have a scoring implication and sometimes you’ll want it just to deprive an opponent of an especially valuable choice. Calculating score as you go along is important, and that will involve sometimes deciding on taking cards based on planetary allegiance. 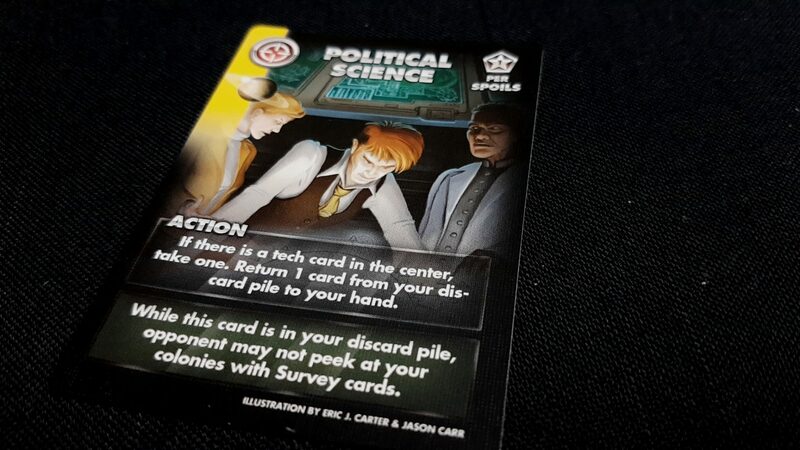 Game flow has a degree of malleability to it – for example, the ‘political power’ card permits someone to play it before they draw their own card. Players might take multiple actions depending on the number of icons they have available. Cards may swap ownership, and presence of a card in the discard doesn’t necessarily mean it can’t be played. This interplay of elements is one of the things that makes Microcosm function as a game and it comes with a cognitive cost. There’s a synergistic element here too that must be taken into account when considering its cognitive accessibility. When taken along with the shifting value of cards based on scoring, sometimes weirdly unintuitive actions will be necessary to maximise opportunities. The standard game cycle is ‘draw then play a card from your hand’ but that’s not necessarily the best thing to do. The passive effects that linger inside a discard pile even mean that simply taking cards back into your hand is not a straightforward decision. We don’t recommend Eminent Domain: Microcosm in either of our categories of cognitive accessibility. Every single action in Microcosm has to matter, and every card is likely to be important when it comes to scoring. As such there’s not a lot of room here for making mistakes. You’ll take nine actions through the course of the game and that means that decisions are impactful. Score disparities can be significant as a result. What’s more problematic though is that the game is markedly competitive and interactive in its aggression. 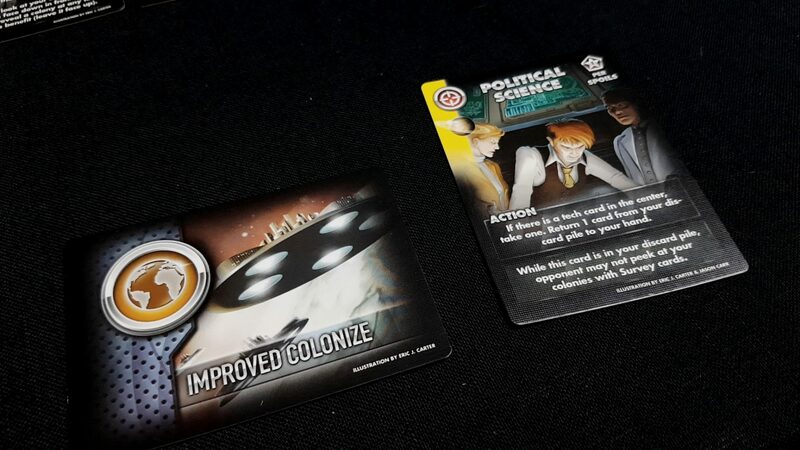 A warfare card for example lets you steal away a colony for spoils – specifically colonies that your opponent has peacefully colonised. You can force opponents to discard tech cards, and if you’ve got enough of a science base you can then pick that same card up in the same action. You can block your opponent from drawing cards in certain ways, or steal key cards from their discard pile. You can peek at their colonies, giving you an asymmetric advantage when it comes to waging war. It’s quite pointedly PvP in its mechanisms and a lot of that is built around a kind of ‘take that’. Worse, it’s built on a ‘take that’ with unreliable repercussions. If you have the right card in your discard pile, you can block people from being able to retaliate. It’s even possible to very much lock your opponent out of being able to play much of anything that matters. There is though no player elimination, and since it’s a two-player game there’s no way for anyone to gang up on anyone else. While there’s no easy way to undo mistakes, it’s also only a ten-minute game so they don’t linger on and haunt you longer than would be reasonable. We’ll very tentatively recommend Eminent Domain: Microcosm in this category. You’ll have a maximum hand size of nine cards during the course of play but not all of them will need to be dealt with at a time. A card holder might be necessary but depending on the card-holder used it might not be an appropriate solution. Each card comes with information about its action written along the bottom and a large lip of a holder may obscure some of this. It’s not possible to compress cards down to their edges because they have information in both top corners as well as their written effect. Multiple card holders would likely be necessary. However, it’s possible to play a lot of Microcosm with open state without losing anything of value in the process. We shied away from recommending that in the visual accessibility section because it means losing the ability to peek at secret information. That wouldn’t be lost in this category though. There’s some physical awkwardness too around manipulating cards through peeking and also when it comes to discards. It’s not as simple as ‘take all your cards back into your hand’ because you may not want all of them. Sometimes you’ll have to swap cards from one player to another or look at colonies or action cards without your opponent getting to see them. Depending on the way the seating arrangements work this might not be feasible if physical capabilities restrict covert access to information. However, beyond this there’s not a lot that would prevent play with verbalisation – cards have easily describable names and while some of them share a title there’s little need to disambiguate between them. I won’t though say no need because there are scoring implications that come with discards – a lucrative discard might be stolen away from an opponent. Luckily though this isn’t a deckbuilder and there isn’t any need to shuffle cards when they re-enter your hand. In any case, if playing with hidden hands a player would mostly be indicating by ordinal number. If playing with open state, colours can be used to indicate which of the duplicated cards is intended for use. We’ll recommend Eminent Domain: Microcosm in this category. Of the fifteen human characters I counted on the cards, only one is a woman. Sure, she’s a woman clearly in a position of some authority but it seems the real microcosm here is representation. As you might expect – lotta white faces too. The manual at least uses the second person perspective but art-wise it’s a bad proportion. Lots of spacemen, as in space men. 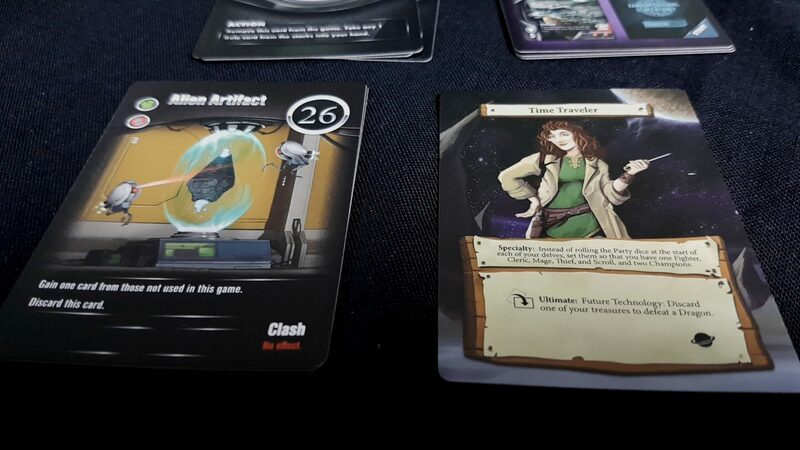 It’s a bit of a shame considering the only human character they have in the promos the game comes with (at least my copy) is pleasingly a nod to a female Doctor– either Time Traveller or Time Lady depending on how it’s flipped. I’m really not a fan of included promos, because they always feel to me not like a bonus but as a way to advertise. It’s like an invocation of the Zeigarnik effect – it adds a ‘I have this, so I should get the game to make use of it’ burden on the owner. I doubt it’s very effective and maybe most people see it as a frivolous little bonus that they’re pleased to get. Given how my main problem with Microcosm is its lack of content though… well. I’m not charitably disposed to look favourably when I see low-grade psychological manipulation where I want to see more game. Especially for a title that costs the better part of £20 and supports only two players. We don’t recommend Eminent Domain: Microcosm in this category. Literacy levels are stressed during play, but there are sufficiently few cards that this is not going to be a permanent problem. Otherwise, there is no formal need for communication. We recommend Eminent Domain: Microcosm in this category. 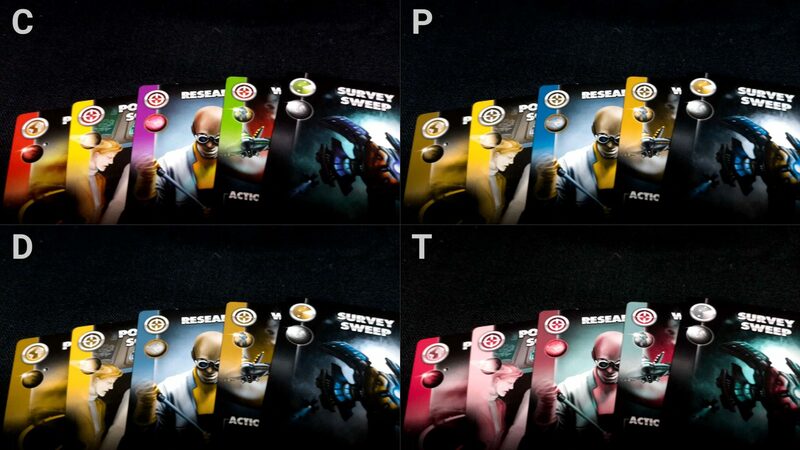 Given the poor contrast and occasional colour palette issues we’d be inclined to be a good deal more circumspect in recommending the game to someone with both colour blindness and visual impairments. The amount of close inspection needed too might also mean that if a visual impairment intersects with a physical impairment then players should think twice about playing. Especially if you’d otherwise be playing with open state because peeking would once again be a problem. However, what Microcosm does have to commend it is remarkable speed of play and a relatively small expectation of table sprawl. Even in awkward circumstances with limited space it’s easy to fit it around modulating symptoms of discomfort. The game lasts only about ten minutes, barring accessibility considerations. While it may not let you explore much of the cosmos during those ten minutes, the fact it lets you do it at all might be worth celebrating. Eminent Domain: Microcosm triggered a genuine little spasm of frustration in me. I am constantly a little bit sad that the exploration of space at speed seems forever locked away from us. In basic recognition of the fact we are shackled to an infinitesimally irrelevant chunk of cosmic grit I feel like space games should give us the universe that reality has denied us. Microcosm doesn’t though. It doubles down on that. It’s like finding out your shiny new FTL warp drive only gets 30 miles to the gallon. It’s not even really like we can recommend it for those with accessibility needs – many of our recommendations are tempered by the willingness everyone exhibits to play with open information. That said, it is very quick to play and sometimes that’s all that might be feasible. It’s not up to me to tell people what games are for them – all I can do is provide recommendations. 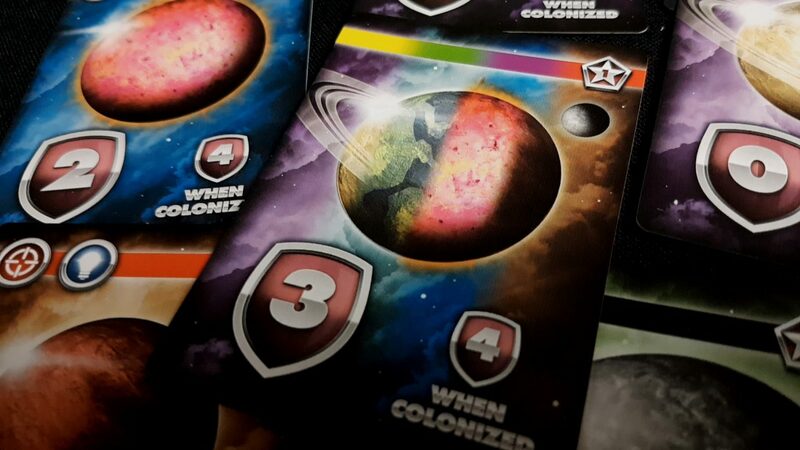 Eminent Domain: Microcosm gave us eleven planets. We gave it two and a half stars in return. It kinda feels like it got the better end of that exchange, really.